It's going to be a cozy Christmas this year as more Americans shop for comfortable apparel and accessories like fuzzy sweatshirts and sweaters, pajamas, socks and slippers. “I think we’re overstressed and the coziness is maybe an escape to a better time," says industry analyst Maria Rugolo of the NPD Group, who adds that a desire for comfort, convenience and versatility extends to other products as well. FILE — Slippers and other cozy items are expected to be hotsellers this holiday season. Rugolo says this desire for cozy comfort is driving sales of smart homing devices — such as virtual assistants and autonomous robotic vacuums — as people stay home more. According to NPD’s 2018 Holiday Purchase Intentions survey, 1 in 3 shoppers plans to buy products for their home this holiday season. Traditional favorites like blenders, electric toothbrushes and espresso makers are expected to do well, too. 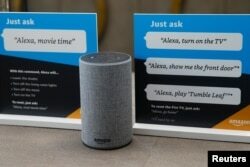 Prompts on how to use Amazon's Alexa personal assistant in Vallejo, California, May 8, 2018. People are also hosting more game nights and other stay-at-home activities, according to Rugolo. Clothing and accessories, entertainment, toys and electronics are expected to be the top-selling categories this holiday, according to the NPD survey. 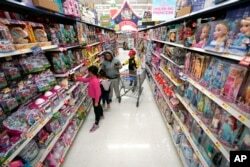 Shoppers look at toys at a Walmart Supercenter in Houston, Texas on Nov. 9, 2018. Shoppers intend to spend an average of $693 on holiday gifts this year. The survey finds that the biggest spenders of all will be Americans over the age of 73, followed closely by the baby boomers, people between the ages of 54 and 72. The calendar has already given retailers their holiday gift. December 25 falls on a Tuesday this year, which gives Americans more weekends to shop between Black Friday — the day after Thanksgiving, which many view as the official start of the holiday shopping season — and Christmas Day. In addition, a strong economy might lead shoppers to open their wallets a little wider. "I think the expectation is that there will be more spend this holiday," Rugolo says. "Unemployment is really low right now and consumer confidence is high."